Noninvasive positive pressure ventilation (NIPPV) refers to the delivery of positive pressure ventilator support without the insertion of an endotracheal tube . This intervention works to improve lung volumes and decrease the work of breathing, making it a practical tool in the management of acute respiratory failure . Due to the multitude of indications, it is important for emergency physicians to understand both the ventilator settings of NIPPV devices and the types of respiratory failure they address. The utilization of NIPPV requires active management by the EM provider. One cannot simply set the patient on initial settings of “ten over five” and walk away; both subjective criteria (eg patient comfort, patient mental status, and degree of air leak around mask) and objective data (eg O2 saturation, respiratory rate, pH, PaCo2) must be taken into account. The provider can start promoting success at the initiation of treatment by starting at low settings and talking the patient through the procedure, both of which can improve compliance . If time permits, baseline blood gases obtained at this point can be useful in monitoring clinical course . Different etiologies of respiratory failure, as described in Figure 2, require different approaches to the titration of ventilator settings. In the case of a patient with an acute exacerbation of COPD, the clinician should initially adjust FiO2 to an O2 saturation of 88-92%, taking care to avoid chasing high saturations that can paradoxically increase shunt, decrease respiratory drive, and subsequently promote patient deterioration. Arterial blood gas measurements should then be taken at thirty minutes and then trended over 1-2 hours of therapy . If the patient continues to demonstrate failure to blow off CO2 or has not improved tidal volumes, ventilation can be improved by increasing IPAP alone while keeping EPAP constant, thereby improving tidal volumes, oxygenation, and CO2 retention [7,10]. Patients with pulmonary edema exhibit type 1 failure and require a different approach. The pathophysiology of pulmonary edema causes alveoli to be less available for gas exchange as the lungs are filled with fluid, leading to a shunt physiology with alveoli being perfused but not able to oxygenate or ventilate. This shunt physiology manifests itself as a low O2 saturation despite the use of 100% FiO2. This requires an increase in mean alveolar pressure to correct which is best accomplished by increasing the IPAP and EPAP in tandem which forces fluid out of the alveoli by an increase in the overall mean alveolar pressure [9,10]. This increase in pressures must done slowly to balance the need for increased pressures against patient comfort and the limit of recruitable alveoli. Persistent need for EPAP pressures 10-12cm H20 should push management toward intubation . Thank you for the opportunity to review this helpful post. As you mention, non-invasive positive pressure ventilation (NPPV) is a potentially life-saving supportive therapy for patients with acute respiratory failure. Emergency Medicine providers should be familiar with when and how to use this important tool. If I were to highlight just one thing in your post, it would be your suggestion to “start monitoring.” This should be in bold and in 30-point font. Attentive bedside monitoring of patients recently placed on NPPV matters exponentially more than any other aspect of therapy. 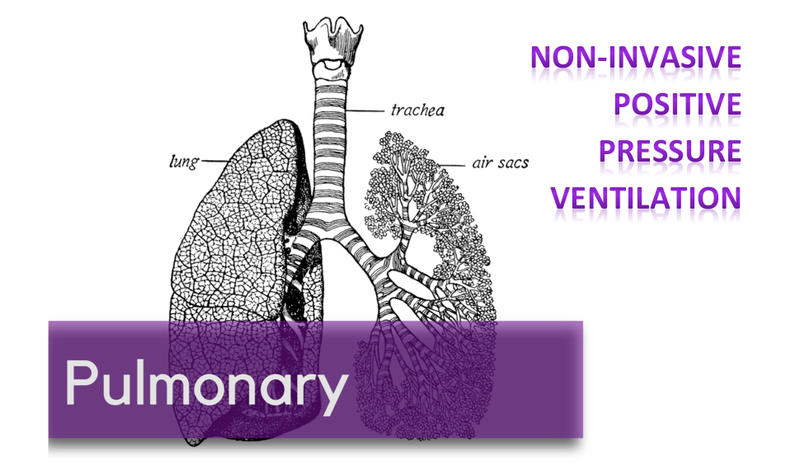 NPPV can decrease work of breathing, improve oxygenation, improve alveolar ventilation, and counteract auto-PEEP. 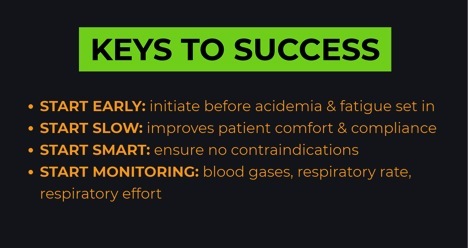 All of these can and should be monitored at the bedside as the pressure requirements to achieve these goals will differ with each patient depending on the mechanics of their respiratory system and the severity of their disease. Close bedside monitoring is also essential to determine if a patient is failing a trial of NPPV and requires invasive mechanical ventilation. When returning to the room, you should be asking yourself the following: Has my patient’s work of breathing improved? Is my patient still hypoxemic? Is their respiratory acidosis better? Are they having difficulty with secretions? How is their mental status? Many studies show that delaying intubation, when ultimately necessary, worsens outcomes so it is critical to recognize a failing patient early and take control of the situation. I think it’s often helpful to set a clear time limit with NPPV, for instance “I am going to trial NPPV in this patient with acute decompensated heart failure (ADHF). 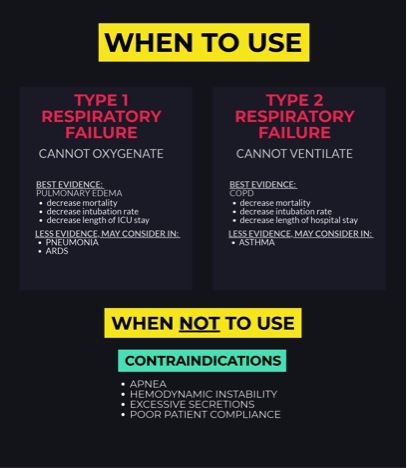 If his work of breathing and RR remain high in 20 minutes, we will move towards intubation.” In general, if you place a patient on NPPV in the emergency department (ED), you should plan to return to their bedside frequently over the next 45 minutes. Make this part of your practice. Expiratory positive airway pressure (EPAP) on NPPV is the same as positive end-expiratory pressure (PEEP) when using invasive mechanical ventilation. Continuous positive airway pressure (CPAP): an NPPV mode where the machine delivers a continuous level of airway pressure (e.g., on CPAP 5, the machine will continuously deliver 5 cmH20 during inspiration and expiration). Breaths in this mode are all patient triggered (an apneic patient will remain apneic on CPAP) and not supported with any additional pressure support. Bilevel positive airway pressure (BPAP): an NPPV mode where you set an EPAP and an inspiratory positive airway pressure (IPAP). Breaths in this mode are patient-triggered (an apneic patient placed on BPAP will remain apneic unless your machine has a backup rate), pressure-targeted (the machine delivers the set IPAP with each patient-triggered breath), and flow-cycled (the IPAP is delivered until the machine senses a set % decrease in patient inspiratory flow at which point the pressure drops back to EPAP and the patient passively exhales). As this is a pressure mode, you do not directly control the tidal volume; instead it is determined by patient effort, respiratory system mechanics, and the difference between IPAP and EPAP (also known as the driving pressure or pressure support). A higher driving pressure (a bigger difference between IPAP and EPAP) will produce a bigger tidal volume. BiPAP and BIPAP: these are two proprietary modes of BPAP (the first by Respironics and the second by Drager). It’s unnecessarily confusing, I know, but just be aware that BiPAP and BIPAP are brand names, BPAP is the generic term which you should be using. On BPAP, airway pressure cycles from the set EPAP to the set IPAP (e.g., on BPAP 15/5, the pressure will cycle from 5 cmH20 to 15 cmH20 with each breath). On invasive mechanical ventilation in the pressure control mode, you don’t set an IPAP but rather a desired level of pressure support (PS). This is the pressure above PEEP. So on PS 15/5, the pressure will cycle from 5 cmH20 to 20 cmH20 (15 cmH20 above PEEP). In other words, BPAP 15/5 will generate the same pressures as PS 10/5. Titrate EPAP to achieve the desired O2 saturation (aim for >88% in COPD pts who are chronic CO2 retainers). As noted, the level of PS is defined as IPAP-EPAP; increased IPAP-EPAP=increased tidal volume/increased ventilation. Remember that whenever you increase EPAP you have to increase IPAP by a similar amount to maintain the same level of PS (e.g., if inadequate oxygenation: change 10/5 to 13/8 to keep a PS of 5 cmH20). In general, EPAP should not exceed 8-10 cmH2O and IPAP not exceed 20 cmH2O (this level of support should make you strongly consider intubation). Titrate FiO2 down to ≤60% as long as adequate O2 saturation is maintained. EPAP/PEEP: In addition to decreasing preload and reducing airway collapse at end-expiration as you mention, EPAP/PEEP also counteracts the effects of auto-PEEP (which helps decrease work of breathing in severe COPD/asthma) and decreases left ventricular afterload. Just to be clear, NPPV does not a have strong evidence base in all forms of pulmonary edema, only hydrostatic/cardiogenic pulmonary edema (ADHF). In ADHF, NPPV (especially the EPAP part) works as an LV assist device by dropping LV preload and decreasing LV afterload. Whether you place a patient in ADHF on CPAP or BPAP doesn’t seem to matter much. This was best studied in a 2008 NEJM trial that did not show any clear benefit to BPAP vs CPAP (although both were better than standard O2). It is important to remember that the use of NPPV/EPAP may cause clinical deterioration in patients with right ventricular failure. EPAP increases RV afterload and drops RV preload so close bedside monitoring is essential if using NPPV in patients with RV failure. ARDS is also a pulmonary edema syndrome (edema in ARDS is caused by disruption of the alveolar epithelial/endothelial barrier) but the evidence for NPPV is much weaker than in ADHF. Based on some recent trials, many of us are moving towards high-flow nasal cannula in this setting rather than NPPV (reviewed in detail here). A small semantic point: Throughout your review, you mention monitoring “compliance.” Generally, “compliance” denotes a patient’s willingness to follow treatment recommendations. “Non-compliance” tends to be a negative term; a patient knows what they should do but chooses to do otherwise. What you are assessing when using NPPV in the ED is not “compliance” but “tolerance.” In 99% of cases, the factors that limit use of NPPV in acutely ill patients in the ED are not within a patient’s control: fear, anxiety, delirium, vomiting, feeling like they are unable to breathe or get enough air, etc. Talk with RT and your program leadership to find a time to trial NPPV. Clinicians who use NPPV should know what a high EPAP or driving pressure feels like so you can better coach your patients through what they are going to experience when starting therapy. Liesching T, Kwok H, Hill NS. Acute applications of noninvasive positive pressure ventilation. Chest 2003; 124: 699–713. Lim WJ, Mohammed Akram R, Carson KV, Mysore S, Labiszewski NA, Wedzicha JA, Rowe BH, Smith BJ. Non-invasive positive pressure ventilation for treatment of respiratory failure due to severe acute exacerbations of asthma. Cochrane Database of Systematic Reviews 2012, Issue 12. Posted on July 16, 2018 by NUEM Blog and filed under Pulmonary and tagged NIPPV CHF Respiratory failure Respiratory distress COPD Bipap CPAP.